1 tablespoon salt. I used sea salt in mine. Let yeast and salt dissolve for 5 minutes. Add four cups of flour, preferably hard wheat bread flour. I had 3 cups of 00 soft wheat Molino Grassi Italian flour and then I added 1 cup of organic Rye flour thar has 30 grams of whole grains and gives the bread a nice, nutty flavor. You can use any variety of flours you would like, as long as the total amount adds up to 4 cups. Mix thoroughly and then let rise with either a glass lid cover or a clean kitchen towel to cover for an hour or more. Press dough down and then shape into a formed round loaf or you can also bake in any type of pan you like. 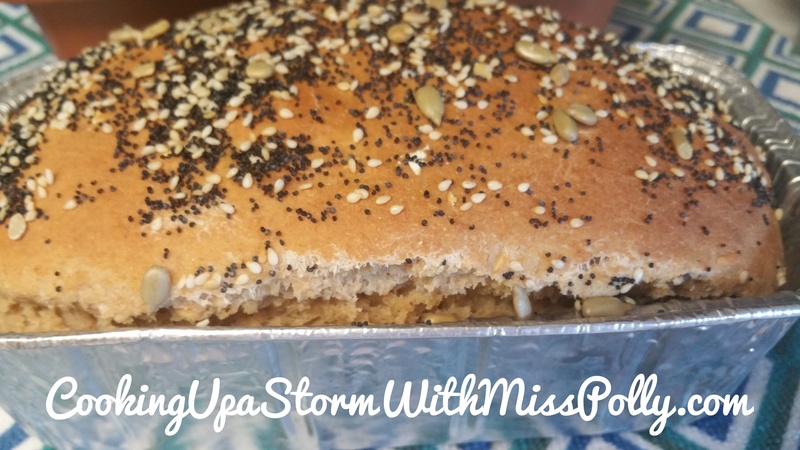 I used my Sur La Table Italian handmade loaf pan, that I love so much. It is slightly bigger than a standard loaf pan. Brush with melted butter and sesame seeds or you can add any kind of artisan bread topper you like, or simply brush with melted butter or margarine, and bake. All are great. Bake it to suit your personal tastes. Bake at 450 degrees for 30 minutes, adding in a pan of water on the bottom rack so the loaf steams while it bakes. I baked mine and my smaller size Cuisinart convection oven. It doesn’t heat up the kitchen quite so much, and in the southwest that’s something you want to be concerned about! I also put a small little Pyrex casserole dish of water inside the oven right before I put the bread in, which worked out fantastic. The bread was so easy and came out fantastic. The crumb came out nice and soft, and it has a very forgiving rise time. You can let it rise for an entire day and then simply bake it, which is what I did. Afterwards I brushed it with little bit of margarine Bluebonnet. You can use vegan butter or butter though. I also put some my artisan bread topping on it before it baked. Nothing like homemade bread! Wonderful recipe!